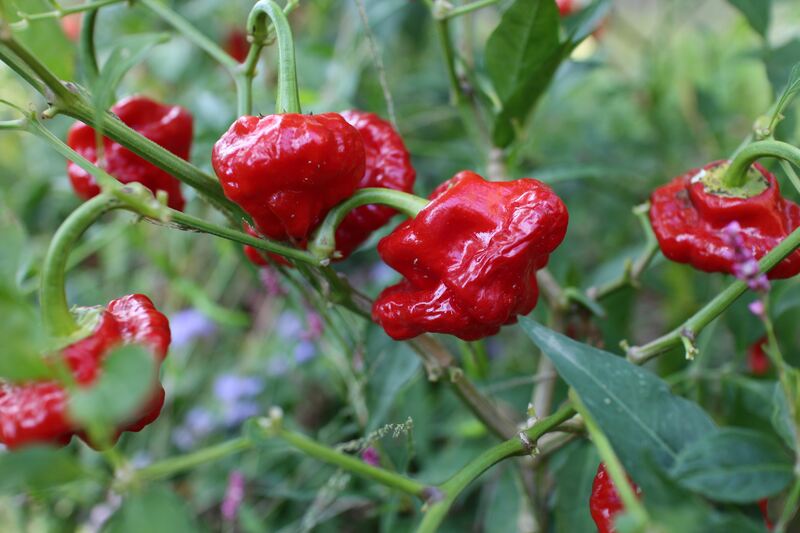 This was the year of the pepper. 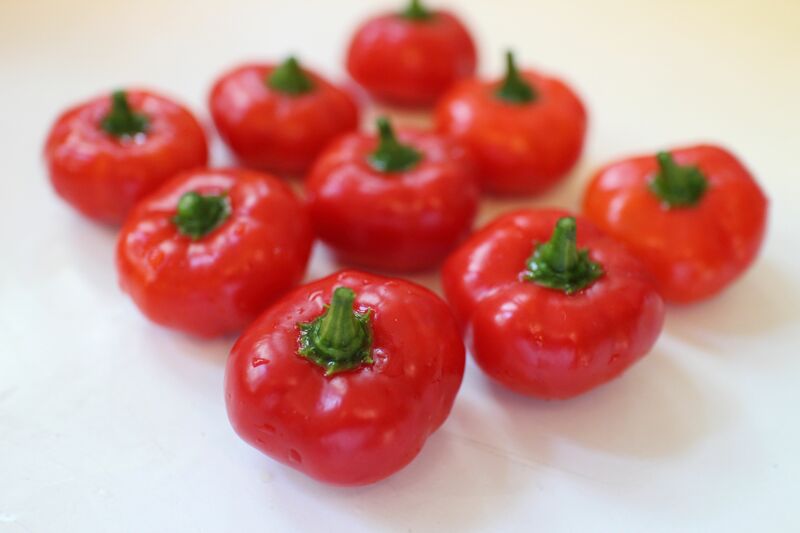 I experimented with varieties we might want to grow in bulk in the future and ended up with a Noah’s ark-worth of capsicums, a tenth of what our local grower claims to tend, but that’s still 50 varieties. (Check them out: Cross County Nurseries and http://www.chiliplants.com. Great but unobtrusive place, sweet people, awesome inventory. I chose my peppers based on what was available since I ordered very late and went to the farm to pick up, but I spread the selection among sweet-medium-hot, early-medium-late, short-medium-tall, eating raw, stuffed, or pickled, accompanying cuisines from all over the place. In other words, this was a wide and somewhat random sampling. Given our slightly shady yard-turned-garden, it was a crapshoot to say the least. I lucked out. 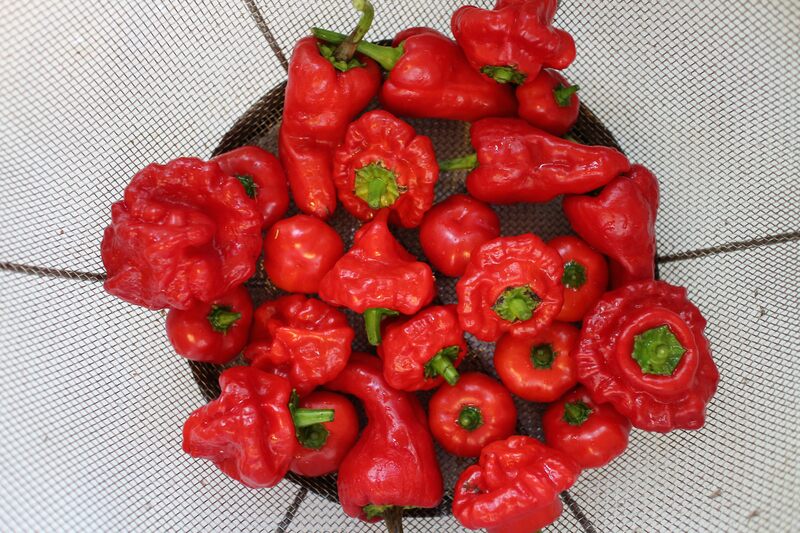 This was a great year to grow peppers locally. Two of the winners in the bunch I earmarked for pickling are Red Squash and Pilange, both picturesque and prolific. I’d be pleased just to have them as ornamentals. Instead of planting them in the garden next year, I might showcase them in pots with a ground cover of compatible herbs or flowers that keep the soil and roots cool. Red Squash, also called Red Mushroom, is a crumpled little number, like a scotch bonnet but not hot. The plant grows like a tree, with a central stalk and umbrella-like arching branches that dangle the peppers like ornaments. Same with Pilange, although its habit is an even taller, more slender stalk with branches that spread at least 3 feet across. If you use large peppers, cut them up. Mine were very small, under an inch and a half, so I left them whole. Prick the peppers in three places with a skewer or small knife. Place them in a very clean, dry quart jar that has a plastic or glass lid. In a medium saucepan, bring the remaining ingredients to a boil over high heat. Stir to dissolve the salt and sugar. Reduce the heat and let the mixture simmer for 5 minutes. 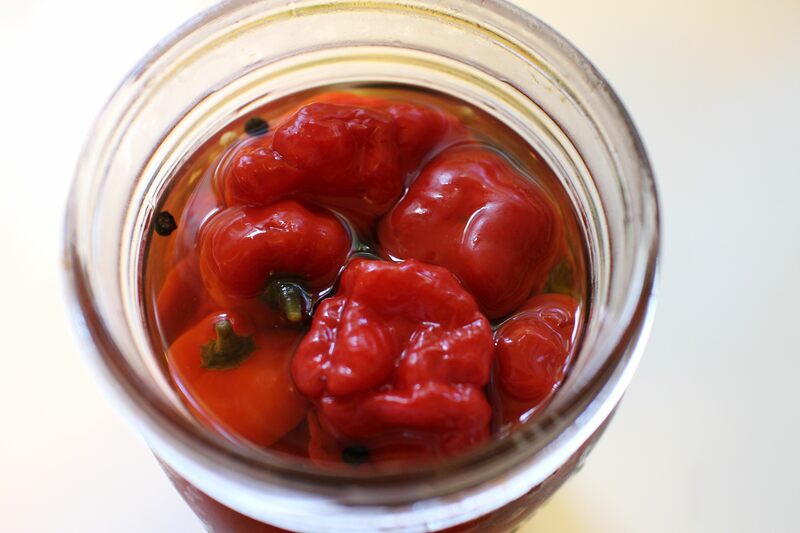 Pour the hot liquid over the peppers and cap the jar. When cooled, refrigerate the pickled peppers.